This stone business card holder is made of a deep green marble, with all the natural variations and richness you expect in real marble. 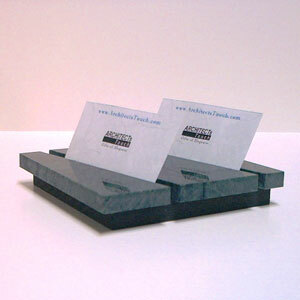 Two slots are great for displaying two separate sets of business cards. Holds a maximum of 30 cards total. Customer Responses for our "Split Personality Card Holder (Verde Green Marble)"